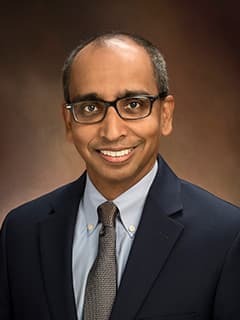 Venkat Shankar, MBBS, MBA, is Medical Director and Associate Chief in the Division of Cardiac Critical Care Medicine at Children's Hospital of Philadelphia. Shankar V. Acute Respiratory Distress Syndrome. In: Gupta P, Menon PSN, Ramji S, Lodha R, editors. Post Graduate Textbook of Pediatrics. Jp Medical Ltd.; 2015. Shankar V. Procedural Sedation in Children. In: Gupta P, Menon PSN, Ramji S, Lodha R, editors. Post Graduate Textbook of Pediatrics. Jp Medical Ltd.; 2015. Cartron A, Pastor W, Shankar V. Outcomes for children with hematopoietic stem cell transplant undergoing renal replacement therapy in the Pediatric Intensive Care Unit. Poster at: 8th World Congress on Pediatric Intensive and Critical Care; 2016 Jun; Toronto, Canada. Cartron A, Pastor W, Shankar V. Trends in patient characteristics and outcomes for children requiring invasive mechanical ventilation in the Intensive Care Unit. Abstract for poster presentation at: American Thoracic Society International Conference; 2016 Jun; San Francisco, CA. Cartron A, Pastor W, Shankar V. Outcomes for hematopoietic stem cell transplant patients admitted to the Pediatric Intensive Care Unit. Platform presentation at: Pediatric Academic Societies Meeting; 2016 May; Baltimore, MD. Cartron A, Pastor W, Shankar V. Use of Magnesium sulfate in pediatric acute asthma: an 8-year multi-institutional study. Abstract for poster presentation at: Society for Critical Care Medicine Annual Congress; 2016 Feb; Orlando, FL. Cartron A, Pastor W, Shankar V. Characteristics of children with asthma admitted to ICUs: a multiinstitutional retrospective study. Abstract for poster presentation at: Society for Critical Care Medicine Annual Congress; 2016 Feb; Orlando, FL. Cartron A, Shankar V. Can incremental billing opportunities support the expenses associated with staffing a nighttime in-house intensivist in a mid-sized Cardiac ICU? Abstract for poster presentation at: Pediatric Cardiac Intensive Care Society International Meeting; 2015 Dec; Houston, TX. Cartron A, Watson A, Shankar V. Effect of Separating Intensive Care Units on Physician Productivity: Comparison of Work RVU Generation Between a Cardiac Intensive Care Unit and General Pediatric Intensive Care Unit. Poster accepted at: the American Academy of Pediatrics National Conference; 2015 Oct; Washington, DC. De Biasi R, Song X, Cato L, Floyd T, Talley L, Gorman K, Parra M, Shankar V, Cora-Bramble D, Sable C, Wessel D. Preparedness, Evaluation and Care of Pediatric Persons under Investigation (PUI) for Ebola virus Disease (EVD): Experience from a Pediatric Designated Care Facility. Poster at: Infectious Disease Society Meeting; 2015 Oct 7- 11; San Diego, CA. Cartron A, Watson A, Shankar V. Comparison of work RVU generated by a critical care physician working in acardiac ICU and a pediatric ICU. Award paper, oral presentation at: the Pediatric Critical Care Colloquium; 2015 Sep; Little Rock, AR. Cartron A, Watson A, Shankar V. What do interventional procedures add to physician work RVUs in a pediatric and cardiac ICU. Poster presented at: Pediatric Critical Care Colloquium; 2015 Sep; Little Rock, AR. Oldenburg G. Shankar V, Berger J, Diab Y. Continuous Recombinant Antithrombin Infusion in Pediatric Patients with Cardiac Disease Requiring Extracorporeal Membrane Oxygenation. Oral presentation session at: 31st annual CNMC Keystone ECMO Symposium; 2015 Feb 22-26; Keystone, CO.